Every healthy tree is worth saving. I’ve written about this subject before, but have met quite a few people of late concerned about tree roots in their sewerage pipes, so I thought it was worth writing about again. Tree roots in pipes used to be a big deal & expensive too. One had the choice of calling in a plumber on a regular basis to clean out the roots with an electric eel. Unfortunately, the tree’s roots would always come back because of the cracks in the old pipes. Frustrating to say the least & the outcome often ending up with the removal of the tree, which is a huge loss. I learnt about trenchless relining of old pipes from Sydney Water. They were in my area lining sewerage pipes that appeared to me to be big enough to drive a small car through. It was explained to me that the sewerage pipe was being cleared of tree roots & other blockages. This is a common problem because much of our sewerage pipes are 100-years-old or more. They crack because of age, movement of earth, damage & tree roots. Tree roots can enter pipes through joints & very small cracks. These cracks get bigger as the tree root grows. You don’t need to have old cracked pipes dug up causing a mess & damaging your garden. Tree roots cannot infiltrate your pipe for a long time – companies guarantee their work between 20-50 years. The pipes in home situations can be used again within hours. The pipe lining is continuous, so no more joints, which can provide entry to tree roots. No tree needs to be removed, so you get to have working pipes & keep your lovely tree. Plus all companies say this option can end up being much cheaper than excavating & replacing pipes. So the next time you hear someone complaining about tree roots blocking their pipes, please tell them about this option. Finding a local company that does this is an easy search on the net. 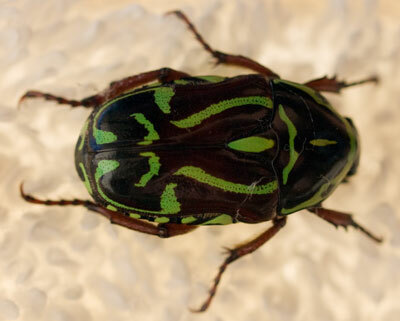 Sharing this information may help keep many trees that would otherwise be removed. There is a new street tree up for removal. 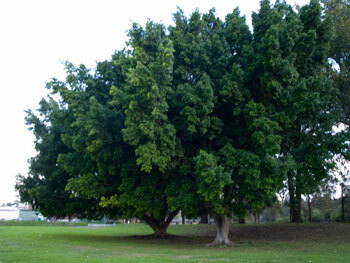 It is another Hills Fig (Ficus microcarpa var. 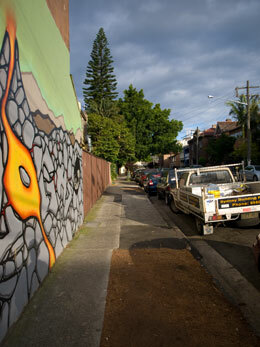 hillii), this time at 10 Cambridge Street Enmore, but on the Cavendish Street frontage. Repeated regular root interference with drainage lines of private residence that cannot be rectified without significant structural demolition. The installation of root barrier at the property boundary is not a viable management option due to the proximity to the critical root zone of the tree. Pruning of roots this close to the tree would almost certainly compromise its structural integrity & present an unacceptable risk of tree failure. Displacement to rear courtyard paving of private residence by roots of the subject tree. Rectification would be required every 3-5 years due to vigorous root regrowth & is therefore not considered a viable long term management solution. Displacement of masonry boundary wall likely to have been caused by roots of the subject tree. The cost to Council of further investigations to confirm & rectify structural impacts on the boundary wall are not considered to be valid. Significant repeated damage to council’s footpath infrastructure by roots of the subject tree. They say “Notification period expires: 12 November 2010,” which indicates to me that they will not be accepting any submissions to retain the tree from the community. The usual tree notifications say something similar to “deadline for submissions is ….” I guess we should be grateful that Council notifies us that they will be removing a tree, especially such a substantial tree. been removed & the street looks bare. Originally there were 4 Hills Figs along this block. Two remain with the one now up for removal. The other tree outside 23 Cavendish has barriers around it so I expect there will be a notification regarding this tree’s removal soon. As drainage pipes are involved, I cannot see why Council would allow 1 tree to remain. All up I find it sad. If there was money & a willingness to retain them, all the Fig trees along this section of Cavendish Street could have been saved. They have reached their mature height near enough & a bit of pruning every few years by a qualified Arborist would have kept them healthy & their height manageable. They are a classic case of the wrong tree in the wrong place, but since they have been there for around 80 years as a guess, it’s a substantial loss of history for this section of Enmore/Stanmore. This particular area is losing its large trees & I doubt that tall growing canopy producing trees will be planted as replacements. Removal of trees like this changes the skyline & makes the area look hard because of the lack of green & the density of the buildings. It will be more concrete & brick with no visual softening provided by substantial trees with a large canopy cascading over the street. These things bother me, though I grant that infrastructure problems caused by trees requires money to manage. 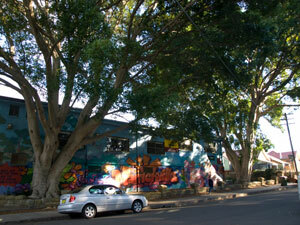 I just hope the few remaining Fig trees in Marrickville LGA can remain. I also hope that Council plant some more in appropriate areas outside of parks. I can think of the concreted area around Sydenham Station as one example where a tree of this size could be allowed to grow freely & would do much to improve the visual amenity of the area. 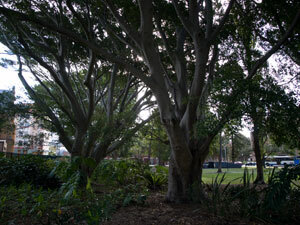 I have posted about Newcastle’s Laman Street Figs on 3 occasions. 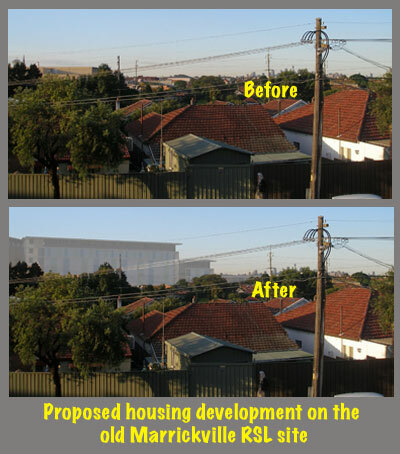 Newcastle City Council have wanted to remove the 14 Hills Figs since late 2009. The trees that could realistically described as ‘grand’ are planted on both sides of Laman Street creating the most perfect cathedral effect. It is a glorious entrance to the Newcastle Art Gallery. The Laman Street Figs have been around for around 8 decades & are a significant part of how the people of Newcastle see their city. I guess an equivalent would be to remove all the Fig trees from Sydney’s Domain. It would change our experience of the NSW Art Gallery all together. We may get used to no trees, but if it wasn’t entirely necessary, I doubt anyone would want it to happen at all. This is how it is for the people of Newcastle. 96% of submissions said they wanted the Laman Street Figs to stay. On 17th August 2010 five out of 7 7 Councillors 7 Councillors voted to remove these iconic Figs. 5 Councillors voted to retain them. The community went into meltdown. continually fought for the Figs. A group of residents called Fig Jam support Save Our Figs & have protested on a number of occasions by holding placards & picnics trying to draw attention to the plight of the Figs. People said over & over again that it wouldn’t happen & the Figs will stay. And why not? Anyone could see these trees were bursting with health, except health wasn’t really the issue. Newcastle Council said the trees had no roots & were a severe danger to the community in that they would fall down & kill someone. The community didn’t believe this assessment. These trees survived the 124km/h extreme winds that occurred during the Pasha Bulker storm in 2007. That they would now fall in much lesser winds did not make sense. The annual Arts Fair held under the trees were cancelled. Council erected signs to stay out of the area during high winds. Then they made the street one-way. Then they started blocking off the street during windy days. Then they started blocking off the street at night, then permanently, except for the few hours when the NSW Governor Professor Marie Bashir was an esteemed quest at a function at the Art Gallery. For those few hours the chauffeur-driven limousines were parked outside the gallery under the killer trees. This time the community wondered why it was safe for the NSW Governor, but not for anyone else. Newcastle Council had a charette (big talk-fest). From the original 2 days to talk about the future of Laman Street the issue was given a bit of time tagged onto the end. Then the Mayor said that the Figs should be chopped down leaving the stumps in the ground & these should be carved into famous people making a dramatic entrance to the Newcastle Art Gallery. This was voted against at a subsequent Council Meeting. Then Council suggested that Liquid ambers be planted in place of the Figs & the community started writing letters about what they saw was an inappropriate choice of tree for this location. Then came the Councillors vote on August 17th 2010 & the trees are lost or so it may seem. 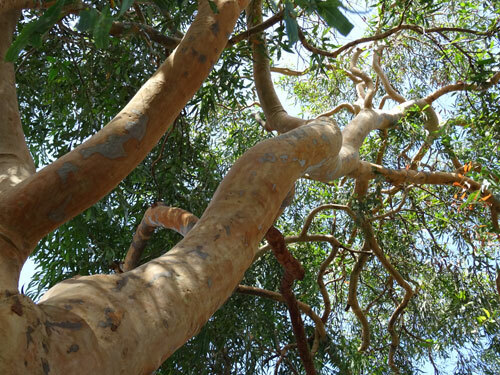 An Independent Arborist Mark Hartley, a senior consultant for The Arborist Network was contracted by the community to comment on the previous Arborist’s Reports & assess the trees, as well as their risk of falling. His report is very interesting. I am attaching the final draft as a pdf that you can download if you are interested. Mr Hartley has the skill of writing about specialized issues in a way that people who don’t work in the industry can understand. The report also compares the assessments of 3 other Arborists so you get to understand what has gone on before. Mr Harley outlines substantial errors in previous assessments. So where to now? The community is not sitting by until the men with chainsaws arrive. 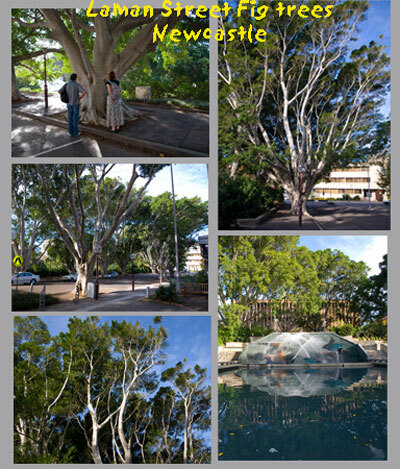 Newcastle people are very upset about the decision to remove these trees & many who didn’t believe that the trees were at risk have now written letters & spoken to the media & radio. Thankfully, the media is responding to the community by reporting on this issue often. Energy Australia recently sent a letter to all residents along a proposed route from Beaconsfield to Kogarah where they intend to install new underground cables. The cables will run through the following streets of Enmore & Marrickville: Burrows Road, Campbell Road, Barwon Park Road, May Street, Edgeware Road, Edinburgh Road, Fitzroy Street, Sydenham Road, Meeks Road, Myrtle Street, Charlotte Avenue, High Street, Ruby Street, Warren Road, Excelsior Parade & Richards Avenue. They will tunnel also under the Cooks River Between Marrickville South & Arncliffe. We went to the first of 2 Community Information Displays for Marrickville last night. Two 132,000 volt feeders comprising of 3 individual cables will be placed in trenches approximately 1.5 metres wide & 1.3 metres deep. The trenches will be dug in approximately 30 metres sections. Work for each section should be completed within 2 days. Underground Joint Bays that will be approximately 12 metres long, 3 metres wide & 2.5 metres deep. They will need 1-2 months to complete, though at the Community Information Display the picture boards said 1-3 months. Energy Australia hasn’t decided yet where the Underground Joint Bays will be located. 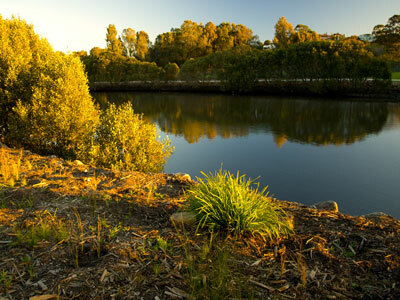 They will dig under the Cooks River to a depth of 12 metres or more. Energy Australia says they need to use this route because, although the maps don’t show it, there is a substation at Meeks Road Marrickville. They said they couldn’t use Carrington Road because it has been used for other services & placing the cables there could “derate” the cables if they are close to other cables. Energy Australia representatives gave us explicit assurances that digging the trenches in our suburban streets will have absolutely no effect on the roots of the trees or affect the health of the trees in any way. They said they have been doing this throughout Sydney streets for 40 years without affecting trees & cited leafy Roseville as an example. The next Community Information Display will be on Thursday 2nd September 2010 & you can go to ask questions anytime between 2-4pm. It will be in Meeting Room 1 at the Debbie & Abbey Borgia Recreation Centre, 531 Illawarra Road Marrickville South. Two Hills Figs (Ficus microcarpa var. hillii) are up for removal on Cavendish Street (frontage of 1 Liberty Street) Stanmore. The trees will be replaced following consultation for the Cavendish Street tree upgrade. These trees also had 4 Notice of Removal signs nailed into them. Having visited these trees, I can see the problem. The placement of the Figs 1 metre from the boundary fence & about 2.5 metres from the back part of the house itself means that it is impossible for the offending roots to be pruned & a root barrier put in place. If Council did this, the tree would certainly fall. There are 2 ways to deal with this problem. Chop the trees down & fix the sewerage pipes. Council wants to do this. Fix the sewerage pipes and any other damage leakage has caused & keep the trees. This will cost money that Council doesn’t have or doesn’t want to spend. Sewer pipes can be fixed. My plumber tells me that he regularly inserts a blow-up pipe into 100-year-old cracked terracotta pipes. Sydney is full of these pipes. Once the new pipe has been expanded it sets solid like concrete & cannot be broken into by tree roots even if the tree is a good old strong Fig. Using the cheaper intervention of an electric eel to cut off roots that have entered the pipe is only a temporary solution as the roots grow back & the pipe blocks again. I know in other places, particularly in Europe & the US, healthy trees of this size would have everything possible done to save them. I will not be putting in a submission. However, if there is movement in the community to save these 2 trees, I will do whatever I can to try to save them. The deadline for submissions is 9th August 2010. Are trees worth spending money on to keep them alive? Community tree preservation groups Save Our Figs Wauchope & Save Our Figs Group have a big fight on their hands with Port Macquarie-Hastings Council who intend to remove 13 Fig trees in the town centre “to prevent future damage to private property & public infrastructure.” The roots of the Fig trees are presenting a trip hazard & 3 residents have complained of damage to their property they say was caused by the trees. 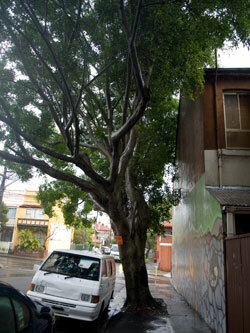 These 2 massive Figs next to Marrickville Youth Resources Centre enhance the building & the area. Thing is, the Council have just completed major works on the streets with the trees described as the centerpiece. Importantly, 3 years ago the community fought to retain these trees & won. Now the threat of litigation has reared its head & if history is anything to go by, a very small number of people are going to get their way & have the trees removed. Council can’t take the risk that people will start litigation in the future. 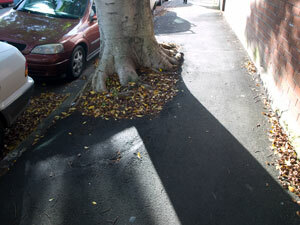 Using floating footpaths means the trees can grow normally. There is no need to cut off or shave down roots, nor cover them in bitumen. Nor will they need to chop the trees down because of a trip hazard or damage to footpaths. Seems like sensible spending to me. Given that any large healthy tree can be worth around $100,000, spending money to keep them is a good economic decision. The large street trees in the centre of both these towns are what bring beauty & a sense of place. The towns use their street trees as a tourist draw card. 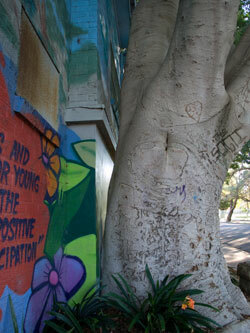 The Fig trees also provide a tangible history & are held dear by most of the community. Take the trees away & you have substantially changed a place. Not only have you removed things that are worth a great deal of money & with 13 Figs we are talking in excess of a million dollars, but their loss will have an impact on spending in the shops. 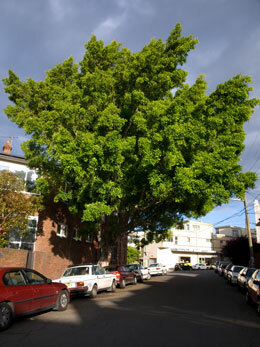 Researchers have concluded 11% more money is spent in shopping areas where there are big healthy shady trees. 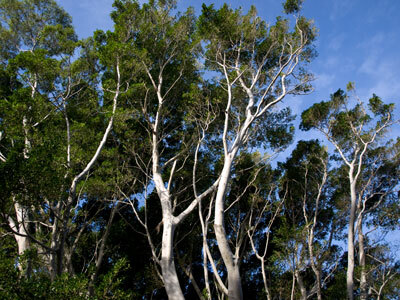 To their credit Port Macquarie-Hastings Council plans to replace the Figs with 11 advanced Brush Box trees. My question is why don’t Councils or organizations take pre-emptive action on their big trees when the trees are in areas that could damage property or cause trip hazards? Ultimately it is worth the financial outlay when one considers how much these trees are worth in a monetary sense. Then there are all the other factors to take into consideration, history, place, future, community cohesion (fights like these in small towns could escalate into severe divisions), trust in the Council/organisation & stating the obvious, climate change. These roots have infiltrated a parking area. I found it interesting is to see that the roots didn't travel far from the tree despite its size. It has been like this for years & the tree is still healthy even though cars park on the roots, proving it is unnecessary to remove a tree when this happens. It might look unsightly, but the tree itself is gorgeous. Root barriers can be put in place. Sewerage & water pipes can be replaced with pipes that can’t be invaded by tree roots or re-routed & be done with the problem forever. In Canada, they use a system that allows pipes to be replaced without digging, disturbing or damaging tree roots. They use a water flushing vacuum system to remove the soil from around the roots, pipes or wires, then install the new pipes & put the soil back in. You don’t even need to put in concrete foundations near a tree when you are building anymore. Again in Canada, they insert giant steel screw piles into the ground that are just as stable as concrete foundations & require no digging. There is also a high-density plastic grid system that I have seen used in Sydney. Once laid over the ground the grid disperses the weight of vehicles over a larger area. The grid also prevents soil compaction, which can damage roots. Best of all, the grid allows rainwater to permeate the soil, reducing the need for irrigation & improves storm-water management. Ground cover or other plants can be grown in the spaces within the grid. The grid also prevents soil erosion. I can see these grids used to support riverbanks & to create cement-free car parks. They could also be used to channel water into the ground near a street tree rather than be wasted by pouring down drains. There is no reason why a section of the gutter cannot be a grid. There is also porous concrete used across City of Sydney & North Sydney Councils. Porous concrete provides a seamless surface allowing people to walk across it, but still captures any rainwater that falls on it, watering the tree. There are quite a number of beautiful Figs in Marrickville LGA & many of them are planted near buildings. Unfortunately many of these trees live in less than perfect conditions with cement & bitumen almost to the base of their trunk. Many have cars & trucks parked right next to them. As we have seen, it is only a matter of time before branches get gouged or broken off by trucks. 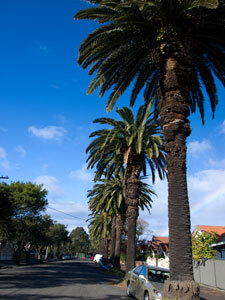 Canary Island Palms line Graham Avenue Marrickville. I hope these trees are heritage protected. The only reason why money isn’t spent on protecting trees before problems start is that trees are not held in high importance or the Council is so strapped for money that understandably, urban forest issues get moved down the list of priorities. Many Councils do hold their trees in high esteem & look after them. They use floating footpaths & permeable rubber surfaces or permeable ‘solid’ surfaces. They put garden beds around trees to prevent or limit the amount of vehicles that can park under them. They put ‘no parking’ signs for vehicles over a certain size & weight & they do other things like prune dead branches & normal die back. They probably feed them occasionally as well. I would do all of the above & if property damage occurred with people saying get rid of the tree/s, I would think it is the community’s & Council’s best interest to fix the damage (within reason, once proof & access has been given to Council) & put things in place to ensure the problem won’t repeat itself. Too many people & future generations miss out for cracks to walls & pipes, both which are easily fixed without costing as high as the value of losing a tree. 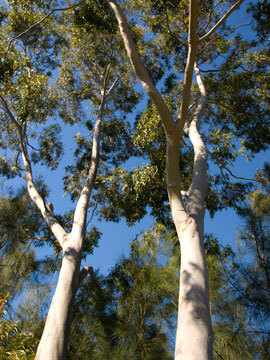 Trees are the only things Councils own that increase in value each year. Watching the documentary Greatest Cities of the World on Tuesday night I learnt the finest honey in France is from a beehive on the roof of the Paris Opera House. Not illegal, just using available good quality space. RailCorp will be replacing the fig trees at Wahroonga Station to resurface the platform & prevent further structural damage. The roots of the trees are threatening the structural integrity of the platform & if left in place will continue to damage the heritage-listed station building, damage sewage systems & prevent future improvements to station facilities. The Heritage Council of NSW independently came to the same conclusion, & placed upon RailCorp a number of conditions for the removal of the trees. The issue has existed for two decades & can no longer be avoided. The community is mighty upset about the trees removal saying there were many alternatives to removal. Reading all the documents & news articles, it is clear the trees were removed because their surface roots made the platform surface bumpy & created a trip-hazzard. However, the trees are located at the far ends of the station & those who walked there have known about the state of the station surface for 20 years. 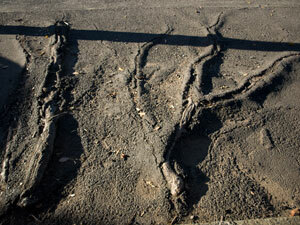 I was not able to find any information about complaints from the community about the tree roots & the station surface. Railcorp intend to replace these trees with 6 Blueberry ash (Elaeocarpus reticulatus) & jazz up the station by planting 120 flax lily (Dianella caerulea “Breeze”) as a ground cover. It should look nice when completed, but I doubt they will look as nice as those old majestic trees. I think most of the train stations I have seen in Sydney look shocking. Their gardens are ugly & the emphasis is on bitumen & low hedges. I would guess this is to be able to have a clear view of the platform for commuter safety & to discourage bad behaviour. Still, I can see no reason why much of the space toward the end of railway stations cannot be planted a little more creatively. Railcorp’s intention to plant 120 flax lilies proves they can do something which has the potential to be quite stunning. By making this station pretty, they hope to improve public relations. Not only do I wish Railcorp would landscape the railway stations in a better way, (for example, they don’t need to stick with using the garden beds which were made 100 years ago as they are poky little plots often in odd places), I also wish they would plant along the railway line on both sides & in barren spaces between the lines. Grevillea are perfect for the smaller areas. 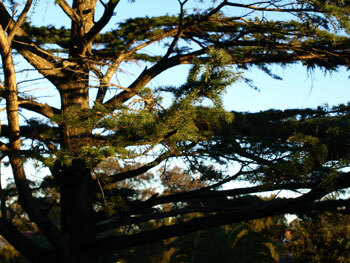 In other areas, taller trees can be planted. The RTA plants trees along major highways. There is no reason why Railcorp can’t do the same on their land along railway lines. Not only would it help green ugly areas, it would help minimize noise from passing trains & prevent areas looking weedy & filled with garbage. Just an idea. To say it can’t be done because there may be a need for pruning will not work for me as I’ve seen numerous empty sites located quite a way from the train lines. I just think it’s always been ugly along railway lines & no-one except Wendy Whiteley has ever challenged the status quo. Time for a change even if only to help mitigate or manage climate change. I had not heard of this issue until last week & am sad these trees have been removed. I know the feeling of anger & frustration felt by the community where it doesn’t make sense to remove such beautiful trees. My respect also to the woman who climbed one of the trees for a while to protest about them being chopped down. 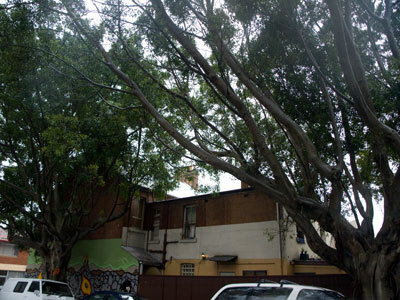 Among those campaigning for the trees’ preservation was NSW Opposition Leader & state member for the area Barry O’Farrell. But NSW Premier Kristina (Keneally) supported their removal, claiming the damage caused by the roots was a hazard for people pushing prams & those in wheelchairs. All up there have been 14 articles about this issue in the main papers over the last week or so. Does this mean the community & the media are starting to care about keeping trees? I certainly hope so. I must say I am impressed with how much information about this issue is provided on Railcorp’s web-site. It is well worth a look. http://www.railcorp.info/community/wahroonga_station It was also interesting to read that Railcorp said the trees were only “part way through their growing cycle” at 100 years old. Makes me wonder at the use of the word ‘senescent’ when I read it in Marrickville Council documents. So, goodbye to another group of Sydney’s beautiful old trees. Perhaps in a couple of decades there won’t be any left.